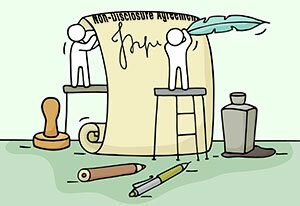 Non-Disclosure Agreements (NDAs) are legal documents that establish contractual conditions for the exchange of information where a disclosing party shares confidential information with a receiving party. The NDA defines information that the parties wish to protect from dissemination and outlines restrictions on use. Many types of information are exchanged under an NDA: ideas, know-how, process descriptions, chemical formulas, manufacturing processes, IP licensing and development, research and financial information. Depending on which party is disclosing information, NDAs may be “one-way” with one party disclosing information and one party receiving, or “two-way” when there is a mutual disclosure. Georgia Tech has several offices that help put NDAs in place, depending on the type of information being shared and the parties involved. Use the information and examples below to determine which group can help you put your NDA in place. For more information on NDAs and the review process at Georgia Tech, read these Frequently Asked Questions. Note: Georgia Tech does not support NDAs for employee consulting. These private arrangements should be put in place between an employee and the industry partners with whom they are working.